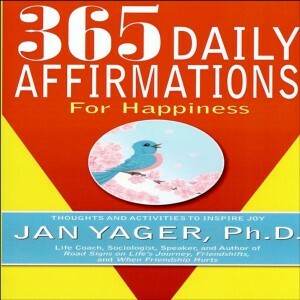 This is a collection of the author’s original inspirational affirmations plus two dozen selected famous maxims on happiness. This useful little book also includes an introduction about happiness, highlighting the work of Norman Vincent Peale, author of The Power of Positive Thinking, and other related works of sociologists, psychologists, and even economists on happiness, there are also activities for increasing happiness at work and in your leisure time, as well as useful resources and references. “If you want to be happy, then it is within your grasp. The book you are holding can have a profound impact on your thinking and your attitude and can help you to do more, be more, and achieve more!”-Willie Jolley, author of It Only Takes A Minute To Change Your Life! 2. I am deserving of happiness. 63. Today, even if in a small way, I have a happier state of mind. 126. I can change someone’s life with one conversation. 227. Making the most of my time makes me happy. 304. Everyday when I wake up I have another chance to have a wonderful adventure. 334. I can work hard to make each of my dreams come true. 335. Being busy is being happy. Jan Yager, Ph.D. is a sociologist and the award-winning author of 35+ nonfiction and fiction titles translated into 30+ languages.